Due to the high cost of GPUs and low availability, we are using a parametric filter for a GeForce GTX 1050 Ti with a max price set. With patience and vigilance, you can find a video card for around this price, and we want to provide a part list that is more accurate to this concept. All of the components are housed in the Cooler Master MasterBox Lite 5 mid tower. 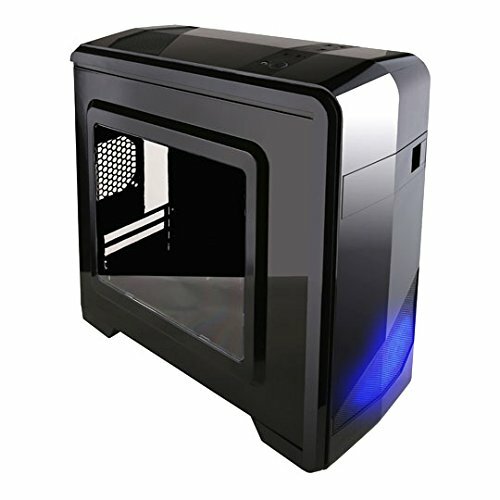 This case offers a lot of premium features for a low price, including a tempered glass case and PSU shroud. It also includes 2 USB 3.0 front panels ports, several cable management features such as cable cutouts and a cabling bump, and it can fit full sized GPUs and nearly all PSUs. What kind of monitor would work best with this build? What is the problem with the intel cpus? For $ 30 you aren't gonna find a good case. The case is not available in Germany are there any other alternatives that you could recommend? It isn't always like that, and you don't really need more than 8gbs as of right now, unless you just want a beefy computer. Now a days running modern games 8gb barley cuts it, you should be focusing on making room for a 16 gb update. Yeah, especially for the games I want to play, (Arma 3 and Star Citizen) 16 gigs in the bare minimum. RAMs works in pairs. Using 1 stick means cutting the speed by half, with the benefit of being able to easily upgrade to 32GB (4x8GB) later. Having 2x4GB means working at full speed, while still being able to upgrade to 16GB (4x4GB), or maybe 24GB (2x4GB + 2x8GB), but I honestly don't know if you should do that. Huh. Well, that's convenient. Is there any problem with having two pairs of memory with such a difference in capacity? I don't think so... I've know of people who have 12gb systems and 24gb systems, must be fine? I don't know if it could impact it or not tbh. The three of you should look in to CAS Latency for an answer to your questions. Not in this case. You see, lower end cpu's such as the pentium in this guide come with a stock cooler that has thermal past with it, so you do not need an additional cooler unless you want it quieter/ smaller. It's super rare for them to blow up but if you aren't confident, you can spend $20 more for this https://pcpartpicker.com/product/WrNypg/seasonic-focus-plus-gold-650w-80-gold-certified-fully-modular-atx-power-supply-ssr-650fx. Also the motherboard/cpu/pci-e cables are sleeved. 80+ Bronze, Blowing up? thats kinda rare for reputable brands. What about windows or linux? Is there a way to get that free? Lots of Linux distros are free and accept donations. So, in theory Linux would be totally free depending on the distro you pick. Windows, however, does not come for free normally. If you go to a university that offers a student edition for free or something like that then it would be free. But, only in that case. Might still be able to upgrade to Win 10 if you have an license key for Win7 ot 8 lying around. Would this build be able to run Fortnite, WW2, H1Z1, PUBG at decent FPS? And if someone can, please tell me how good. this build would do very nicely with those games! the gtx 1050 ti is a little powerhouse! I don't really know anything about computers but what would I need to change about this build (if anything) to get it to stream overwatch at like at least 720p60? If you're still looking for an answer: The AMD version of this build is better for streaming, as the CPU (processor) can handle that better that the one in this build. You could easily stream at 720p or more at 60fps with the included software for the 1050 Ti. how will this build handle just playing Overwatch w/o streaming? 1080p Epic settings will run at around 60fps according to -https://youtu.be/GiaKzUE9mGo - Tweaking the settings will probably net you some spare fps if you need it. In reality, the Intel and AMD versions of this build are virtually identical. The slightly more expensive AMD one might yield more stable frame times, however. This one is just fine if you want to do 1080p 60fps at good graphical settings and maybe stream it. 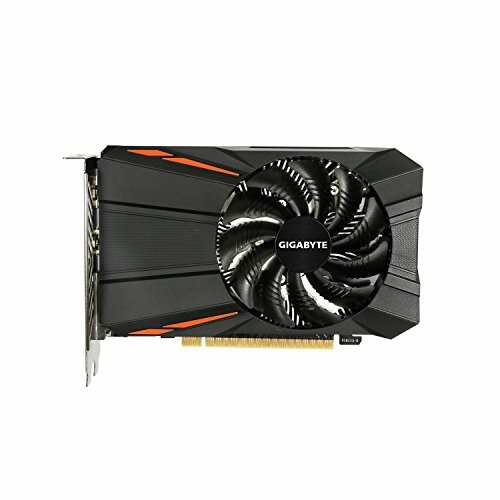 Is upgrading to a RX 570 a good idea? Is it possible to use a RX 580 and still be safe and stable? Can the link for the memory be updated for the people in the UK? Its been not in stock for some time now and its holding me back from being able to purchase all the parts, Thanks. Sorry, this is probably a stupid question, but this won't come with Windows right? Would I have to buy Windows 10 separately if I got this build? I thought G2A sells legit discounted keys? oh that makes sense why they're so cheap, thanks ! How would this PC be for WoW at high settings? I changed only few things with this build. I changed the case and added 16 GB of RAM ( 2 x 8GB ). However the graphic card the build is asking for is out of stock every where I look. I found one but i do not know if the graphic card will work with the build. It is Gigabyte GTX 1050 Ti Windforce OC 4GB GDDR5 128-bit PCI-E Graphic Card (GV-N105TWF2OC-4GD). Will this GPU work. This is my first build. Here is my part list. Can anyone help? Would this build be able to run R6 Siege? Can this run Rainbow Six Siege and GTA 5? Any AMD CPU option in the same price range? There's an AMD entry level build in the Build Guides section. I have a higher budget, so can I switch out the CPU for an i5-6600k? Or would I have to change the motherboard? Also, does the i5-6600k come with a stock cooler? What’s the difference between the AMD gaming build and the Intel gaming build? Why pick a low profile 1050ti when the low profile version typically costs more? And also, why still pick the Pentium with 2 cores + hyperthreading when you can get a R3 1200 and boost it to 3.5 GHZ for a bit more but also get the full 4 cores with 4 threads? You can also knock a bit more off the price by going with a slightly less high wattage in a PSU like a 400w seeing as the 1050ti will never use enough wattage to challenge the PSU, and the Pentium will not either. So if a low-profile card is what's displayed, then it currently does not cost more. As for the Pentium vs the R3 1200, you can check out the AMD version of the guide here. Should I get this or the Entry level AMD build? Any benchmarks for this build? Hi about to change over to PC from console, Just wondering if this build would be able to run overwatch? For now I don't think i need anything too flash just something that can run it and look semi decent. This PC should destroy Overwatch. Yes, it will be able to run it very well, on a mix of ultra and high settings at 1080p. This is because Overwatch is a game that has been optimized to run efficiently on lighter hardware very well. Below is a link to a video benchmark of about what you should expect from this build. The settings to use are included in the video as well. Hello! This is sort of a beginner’s question, but I would like to know if this build (or the AMD version) is suitable for the use of the following programs: AutoCad, Revit, Photoshop, Illustrator and Rhino!! ? The graphics card (GTX 1050ti) should be more than enough but you will definitely need a much better CPU. Given the one here (Pentium G4560) only has two cores it'll be very unstable during certain tasks like rendering or image processing. The entry-level AMD version recommends the Ryzen 3 1200, but for what you're doing I'd recommend a Ryzen 5 1600. Hope this helped. Given the market's current state I find it extremely foolish to build this (or really any build) right now. DDR4-2400 RAM prices are more than double the price of what they were 1.5 or 2 years ago. Also, almost all popular graphics cards were and still are being bought up by cryptocurrency miners. For now and probably till early to mid next year I recommend everyone who cannot wait and need a PC immediately buy a prebuilt computer from manufacturers like Dell or HP; under normal circumstances these wouldn't be very cost efficient but at the moment these are actually easier on your wallet than building a PC that has a graphics card like Nvidia's 1060 3/6 GB or the 1070, or AMD's RX 580. Some of these are actually very reasonably priced given the hardware inflation going on. During some sales, you can actually buy a whole PC for the price of a single component it houses (During Black Friday at some locations and for a short period last month, Walmart had an i5-7400/1060-3GB build for a measly $250). You can easily buy these and buy a better case and power supply seperate then transfer the parts over. I recommend actively checking r/buildapcsales if you want to build a PC soon or cash in on deals on prebuilts or even seperate components or peripherals. Most of the prebuilts sell out very shortly after being posted as the community has over 300k subscribers. Another great subreddit is r/buildapc, where you can get advice or even have someone tailor a hardware list for you in accordance with your needs such as budget and what you're planning on doing with the computer (be it gaming, video editing, or even for work). Most people on here will just move the CPU, GPU and RAM over from one like the $250 Black Friday one Walmart had. In doing so you wouldn't lose money as the GPU alone is well worth over 200 dollars at the moment because of cryptocurrency. Most people don't want to deal with a limiting motherboard that may support the hardware but not be tailored toward gaming (stuff like only 2 RAM slots, not enough fan headers, etc.). Plus, the power supply is probably not very efficient compared to SeaSonic or other third-party options. But, if, for some reason, you wanted to keep the system the way it was you could either do a clean install of Windows or use a program to remove the bloatware; though I don't know how reliable these are as I've never really had to use one. I do not trust that PSU. seems of those that like to do Boom boom. Hopefully it's safe, since this one and the others in the filter were hand-picked by the guy who made the guide, who has a lot of experience picking out parts and building these. SeaSonic is very popular and they make great power supplies. But almost all of the companies that make them have a model or two that are kinda bad. Rest assured, they're not these. The tower is not showing anymore, price wise. Is there a decent cheap tower someone could suggest? Really not bothered about looks! thank you! I get 40fps on lower settings on a 4 year old laptop with worse specs than this so gta v should be fine. Thanks, I’m trying to buy the parts to this pc but the casing is unavailable, any suggestions? In fact would this Build run Overwatch/LoL well? There are no matches for the PSU (I'm guessing in my country). This would be my first PC I build myself and am not sure what sort of PSU I would need. I'm in New Zealand if that helps. What should be my first upgrade on this build? I have more money in my budget than I originally thought. So how do I modify the suggested case? The suggested case is almost twice what I'm looking to spend but I'm not geek-ififed enough (yet!) to know a good replacement...I just know that $100 plus seems like a lot for a case. Will any mid tower do? Do I have to buy windows operating system? Just remembered..
Hey how do you open the case so I can fit the motherboard? Do I need a CPU cooler or no? Thnx for answering. I'm building my first PC soon. Its literally very basic just to get started. The specs I have chosen is great for my Mum & Dads usage (Emails, odd banking and very rare video watching). I cannot wait to build my confidence/skills up enough to create something like this ThoughtA! Can I use CoolerMaster Masterbox Lite 5 RGB ? Does the case come with fans? So I've decided to use this build as a reference to build off of. I've cut the prices and lowered some specs to match my budget. https://pcpartpicker.com/list/JypNnH If you could check it out and give me feedback, that'd be great. I'm a PC noob and this will be my first ever build. Do you guys think this would be too hard as an entry-level builder? I will do my share of research when the times come. Thanks! So long as it is compatible with the motherboard. Does this easily connect to WiFi or do I have to use a lan cable? This parts list doesn't contain a WiFi adapter. You could get something called a PCIe WiFi network adapter that will plug into the motherboard. Almost always, an Ethernet cord will provide a better connection. Hi is this build compatible with any other graphics card? If so let me know but also is it good for some proper gaming like handling World Of Tanks HD graphics? This build will be compatible with any recent (past 4 years) GPUs. The possible compatibility issue would be with the power supply. If your GPU adds too much strain on the PSU, things won't work properly. would you suggest to use a 144hz monitor with this?? I just found an old dell dimension 1100 in the storage closet and was wondering if I kept certain things like the chassis, cpu cooler and power supply if I could buy the rest and save some money. Thoughts? The case is likely the only thing that is reusable, and maybe not even that. This build uses an MATX motherboard, which is a smaller version of the standard ATX form factor. Dell uses a proprietary motherboard layout, and proprietary PSU. It may be worth looking into, but don't get too hopeful. Would this type of build support games such as minecraft and still have good graphics? I am new to building computers. Is there a build guide for this? Hello i am new to building pc's will this come with a OS? How well will this build handle streaming and video editing? And does anyone know of any peripherals combos/bundles that work well with this? Costs more than an Xbox One X and not as powerful. This is only because of the rapid increase of computer hardware prices affecting things like RAM and CPUs. Under normal circumstances this would be a little more than $400 well. Regardless, a lot of people would build this anyway right now if they had to instead of buying an Xbox One X because some of them have never even picked up a gamepad. Also, with a PC, you can do much, much more than simply playing games and streaming movies. You also do not have to pay to play multiplayer, which is ******** in the first place given people paid for the game (unless it's free to play) and pay for Internet service every month. I bought a second hand xbox 360 for cheap ages ago, I still played on my (more expensive) computer because on the console I felt so limited. It will be nice when parts go back down in price, I guess it's a bad time to build a pc for the first time.